I watch my niece and two nephews during the week and need quick dinner options on the days they are here. I was trying to come up with something I could make one night, when I thought of this. I had raw chicken tenders and ham and decided to just try it out. The kids and Paul actually all liked it. Basically…I won! 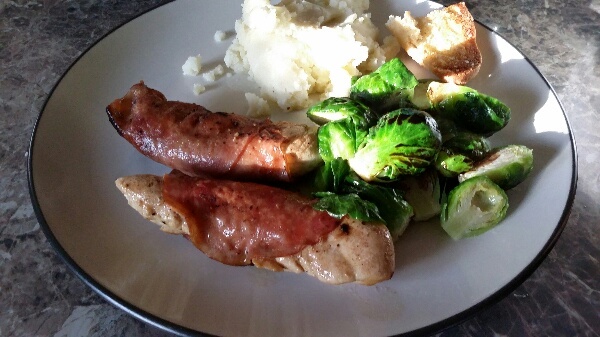 So try it out, an incredibly simple and easy entree that can go well with many side dishes. If you want to get really fancy, use prosciutto instead of the ham. 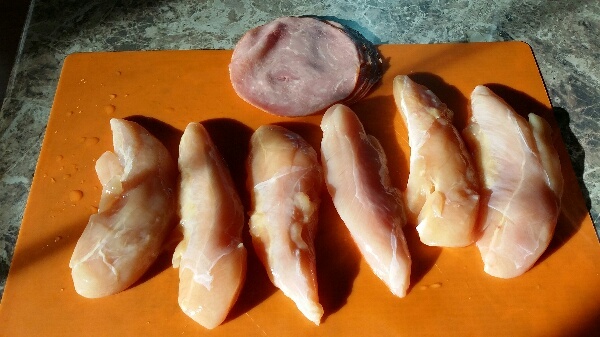 Simply wrap the ham around the chicken tender. Salt & Pepper to taste. Heat up a nonstick skillet on medium heat and pour in about 2 tsp olive oil. Put in ham wrapped chicken seal side down and cook for about 4 minutes. Flip to cook on the other side. Add about a tablespoon of water to the pan and cover to finish cooking, another 4 minutes. Check to see if the chicken is cooked through and serve.